Do you ever over estimate the amount of yarn needed for a new project? I’m pretty sure I’ve mastered the art of it. I always worry about running out of yarn. And because I live so far from big stores, having to wait for an online order to arrive isn’t much fun at all when you’re into a new project and excited to be working on it! Andrea, please send me an e-mail at [email protected] to claim your prize. Please include your mailing address! Yarn for this giveaway provided by A Crocheted Simplicity. During this trip, I picked up a bunch of yarn for the Snowflake Keyhole Scarf I had sketched up. And you guessed it, I bought too much yarn. So, here is the extra I bought, for you to win! 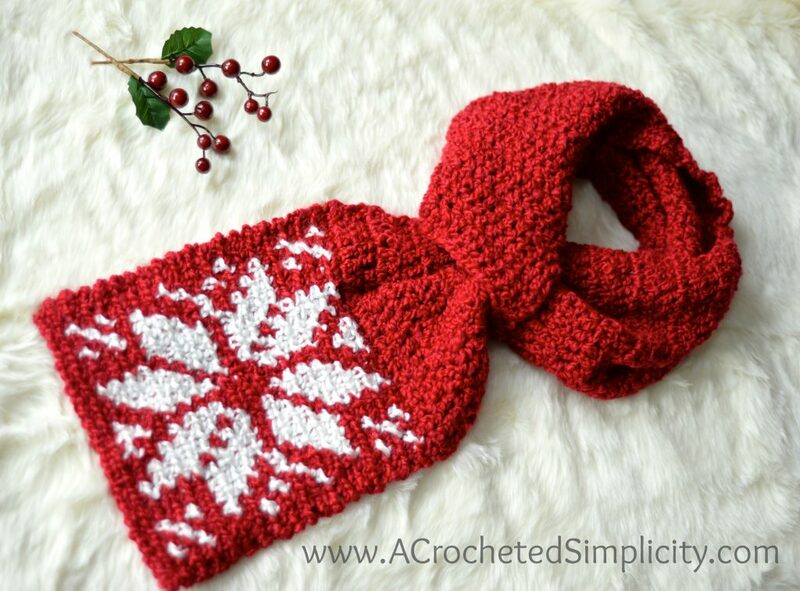 Click HERE or the photo below to be taken to the Free Crochet Pattern! 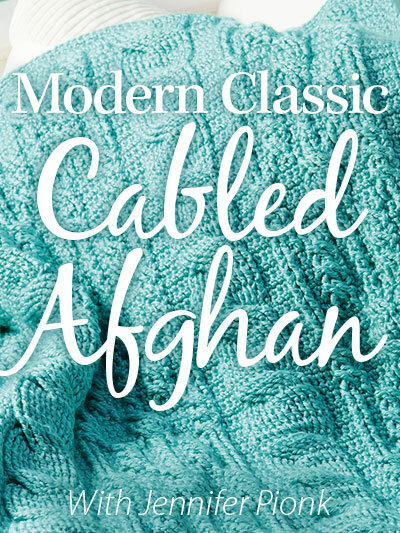 This Yarn Giveaway is open to readers Worldwide, except void where prohibited by law. To win, enter by 11:59pm CST on November 28, 2017, using the Rafflecopter widget above. One lucky winner will be randomly drawn from the entries received. 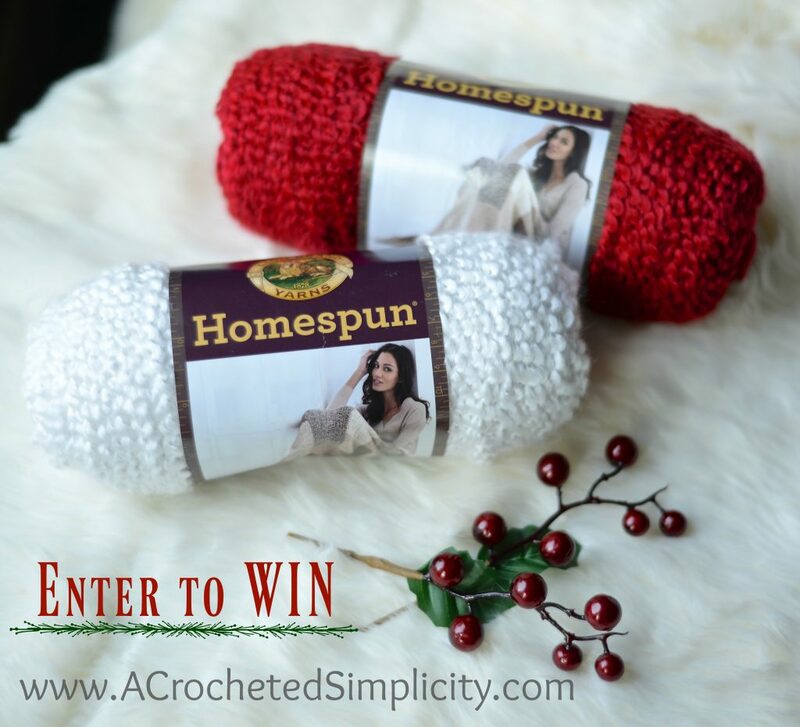 The winner will receive (2) skeins of Lion Brand Yarn Homespun (as pictured above), prize courtesy of Jennifer Pionk aka A Crocheted Simplicity. 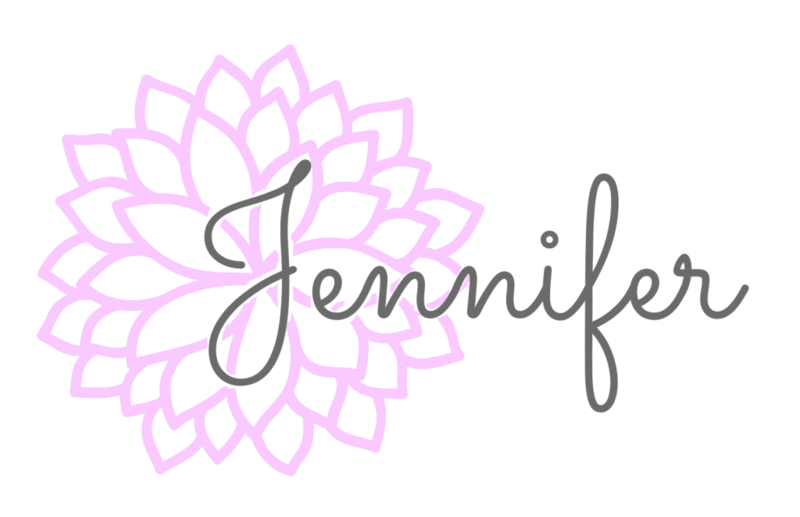 « 4th Annual MEGA Sale Event: Designer Collaboration & Giveaway! Beautiful colors! I seem to lean towards burgundy and tans. A touch of red is always fun! Really love the pattern that this yarn is used for! !! I love the original red, white, and green, but this year I am doing a blue and tan for a beach theme! I love the color purple. I have been doing my Christmas Tree in purple and silver for the last several years. My favorite holiday colors are the traditional reds, greens, and whites. They always bring back such great memories of Christmas as a kid (I’m 70). This is a beautiful scarf. I really want to make it. My favorite holiday color combination is cranberry and white. Classic red & white is my favourite Christmas colours. Red, green and white. Bit of a traditionalist. Great giveaway! Thank you for the opportunity ? I love aqua and white for holidays. Then you can use it all throughout winter. I love silver and white! I would say probably red and white is my favorite. My favorite holidays colors are red, white with green accents or the blue and white. Depends on the room I am decorating. I love red, green, and gold for my Christmas decorating. I love the traditional red and green, but also the ivory and gold. I’m all about greens, usually either emerald or a not too yellowed pine, and a burgundy or more bluish-red to go with it. I’ve got decades of assorted Christmas yarn stash to go through. I tend to prefer silver or snowy white for accents. Love the red and white. Red, white, green, silver and gold! I’m a sucker for classic red and white. It always makes me think of peppermints. I really love blue and white together for winter holidays. You can wear that combo all winter. I don’t have one set favourite colour combination. Other than white, deep red, green, and blue are the yarn colours I am most likely to use in my craft projects. I Love red and green, blue and white for holiday color combos. ? I like dark greens, deep reds, and neutral tones. I like the classic red and white. I also am starting to favor blue/silver/white combo too. Thank you for the free pattern. I can’t wait to whip a key hole scarf up for myself this year. I’m making the hubby a burgundy and black Big Bold Cabled Stocking this year and it is turning out gorgeous! Thank you for the chance to win some yarn! My favorite Christmas colors are red and green but I love other colors too for decorating. I use red and green. Favorite holiday colors have always been red and green with a hint of white !!! I am a traditional Christmas colors person – red, green and white! I love red and white for the holidays! I love silver and blue together!! Red and white are always a favorite at Christmas. Sure cheer me up with a win 🙂 Good Luck everyone and thank you for sponsoring this event! I love the white and green combo! My favourites have to be a combination of deep forest green, deep scarlet and cream. I love the red, white, and green Christmas colors. I also love the combination of teals and silver. I love the green, red and silver combo and of course my silver and blue combo! ? My favorite is blue and white. Blue and white is my favorite combo – it makes me think of snowy nights! Beautiful design. I think it would be gorgeous in deep plum. My favorite holiday combination is red and white. Beautiful design, this wood be fun to make. My favorite holiday colors are red and white. I absolutely love Lion Brand yarns, I buy them when I can afford to. They are so soft and the colors are so vibrant. I like the combo of navy blue and silver the most. I like blue and white, but also red and green. Red & white or blue and silver . Thank you for the chance !! My favorites have to be the traditional red, white and green. But I love throwing in some blue, too! I love the colors. I’m a Christmas girl at heart. I love all the colors so it’s hard to choose. But when I make my Christmas gifts I always go with the favorite color of the recipient. Love the red and white!!! Hip Hip Crochay!!! 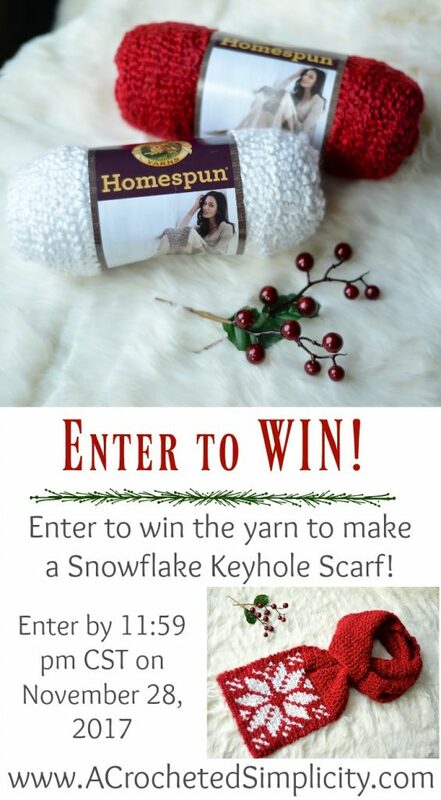 Thank you for the chance to win this beautiful yarn!! !